Sadistica is a continually growing body of work that began in 2010. At first glance, the work may represent pain, darkness and sometimes one needs to take a double take, It's when you look deeper into the pieces, they become storytellers, dream interpreters and memory inducers. The work I produces has always involved making connections between reality and surreality, preservation and decay, memory and forgetting. 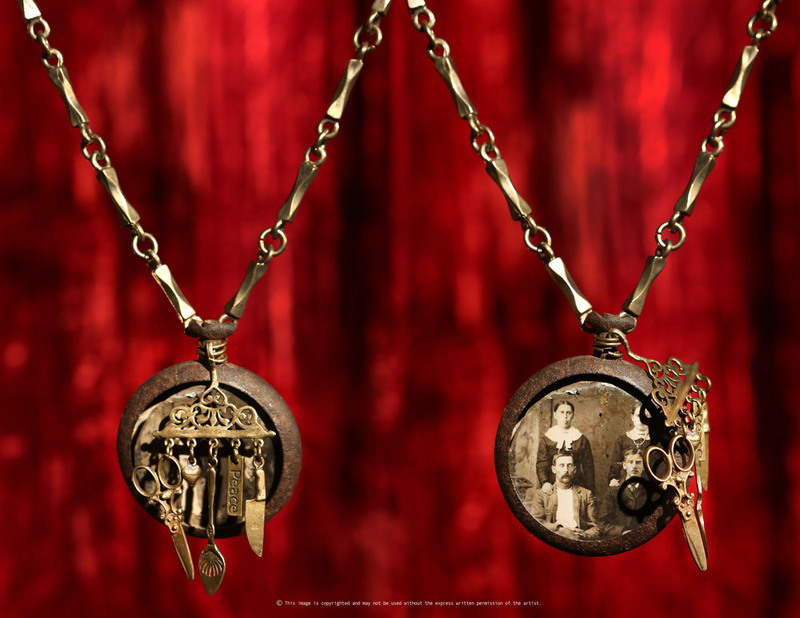 Each piece is an original, one-of-a-kind creation, meticulously crafted from found objects from the scattered shards of lives preceding our own. I have the tendency to personify inanimate objects and feel genuine compassion for those that are damaged or disregarded. I see potential in broken bits and find beauty in rust and erosion. The older an object, the more haunting its ghost. SADISTICA has currently made KEYSTONE ART SPACE its home. The Studio seconds as a gallery, providing the greatest complement for the work as a whole, and is available for viewing by appointment. Born to a Armenian parents, Taline started her beginnings in Lebanon until the war of 1975, forcing her family to move to Tehran/Iran. Not too long after, the Revolution in Iran yet again forced her to relocate, this time on her own, to London, England, where she attended the prestigious Heatherly School of Fine Arts. Upon graduation she attended Middlesex University, where her love of art and design was cultivated in multiple subjects, including photography, print making, fashion, model making, digital arts, and more. After obtaining a Bachelor of Arts Honors in Visual Communication Design, Taline continued her education at Middlesex University, acquiring a Master's Degree in Multimedia/Interactive Design. Her Final project was a British Telecom commissioned assignment, working on a ground breaking Virtual Reality world. Following her graduation, she was hired at Williams Lea, a global business outsourcing company, acting as their liaison at first at Credit Suisse First Boston, then at Texaco’s European head office of design and print production department, where she was exclusively involved with Formula1 Racing projects. Taline is currently the lead designer and the Vice President at “FM MUZIK," a music production firm, where she oversees all aspects of creative process and promotional merchandise. One of her more noteworthy projects is the cover art and design for the 7” single vinyl release of "Zou Bisou Bisou" for AMC's television series Mad Men. Though her design career has always been the backbone of her day to day life, Taline never stopped expressing her feelings and emotions through her creativity in her spare time. 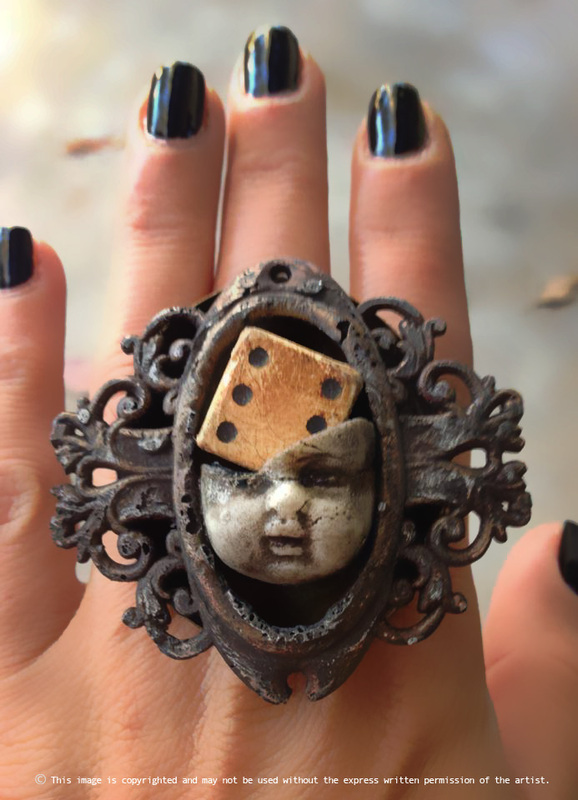 Since a very early age, she developed a fascination with all things old and miniature, hence collecting what she could find that spoke to her emotions on a subconscious level. She began creating wearable art as a hobby from her private collection, and with the encouragement of her friends and family, SADISTICA was born in 2010. The diversity of cultures Taline has been exposed to throughout her life has a very strong presence in her creative style, as has the yearning to preserve the past, melancholy of bygone days, not only hers, but so many unknowns. Taline believes each found item, no matter its size or provenance, holds the energy and emotions invested in it by its previous owner, a presence which helps her in creating not only an aesthetically beautiful piece of art, but to tell their old stories to a new audience. Ultimately the interpretation of each piece is left to the spectator’s own devicesUltimately the tale of each piece is left to the spectator’s own interpretation. All images ©2016 of artists.